This single wine glass will be hand painted with YOUR horse's likeness from a photo you provide. If you order more than one, you may have them done of the same horse, or 4 different ones. Each long-stemmed glass is 8" tall. We can ship 2 for the same price as shipping one, so order 2 and save! Perhaps one for you and one for friends, trainer, barn owner . . . they make great gifts! These paintings will be done in head and neck shot as shown in the sample photo. Please indicate below if you would like halter or bridle included for slightly more. 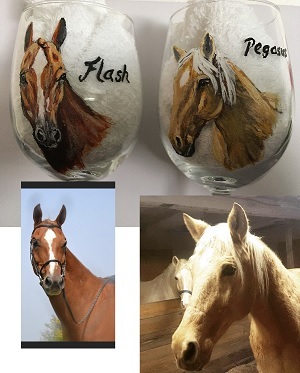 Using glass paints, our talented artist, Susan, will create your horse's likeness, then bake the the finished piece to set the art for durability. We do recommend hand washing to preserve the finish and colors.